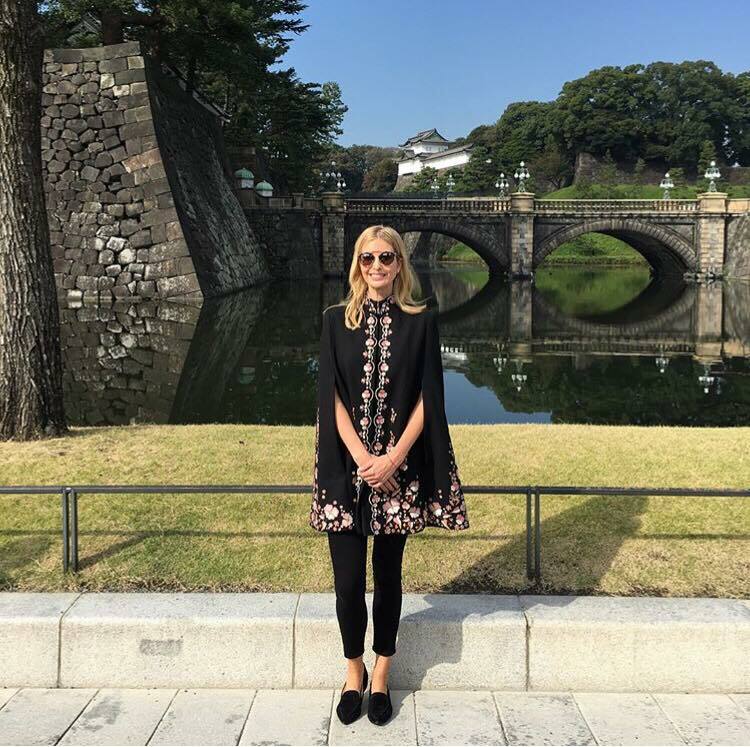 TOKYO: America’s First Daughter Ivanka Trump has always been one to make a fashion statement. In her recent trip to Japan, she has been seen sporting bows. Two of her three outfits have included bow-adorned footwear, while her other outfit featured a dress with a bow-tied sash. Trump landed at the Narita International Airport in Tokyo on Thursday where was seen wearing a smart light-blue Miu Miu coat with a white collar paired with sleek black trousers and a handbag from her own fashion line. She completed the look with black coloured Tory Burch flats with dramatic bow detailing. For her speech at the World Assembly for Women, Trump donned a blush pink Miu Miu skirt suit with faux pearl embellishment, which she paired with black Prada pumps with delicate bows on top. Last but not the least, for dinner with the Japanese Prime Minister Shinzo Abe she opted for a Johanna Ortiz floral kimono that tied at the waist with a velvet bow. However, she kept her shoes plain and went for black heeled pumps.